Chris Spurr (left), now part of the Dons' coaching staff, pictured during happier times. The Dons had been hoping that Sunday’s Ladbrokes Challenge Cup fourth round game at North Wales Crusaders would help kick-start their Championship campaign. But rather than help clear some of the gloom hanging over the Keepmoat Stadium, the 40-12 defeat simply added to it. Like everyone else connected with the club, assistant coach Chris Spurr is desperately disappointed with the fact that they are currently propping up the table after losing their first five league games. “We are giving away too many penalties and we aren’t completing our sets and that has been taking its toll on our defensive capabilities in the second half when players start to tire,” he said. “It’s vital that we get that first win sooner rather than later. 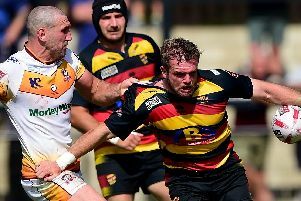 Spurr got the chance to run the rule over both teams when they met recently at the Keepmoat where Eagles are playing their home games this season. “Batley’s John Kear is an experienced coach and he’s made some good signings whilst keeping a lot of players from last year,” he said. “Their back three are particularly good and make a lot of yardage for them. “Sheffield have been a good side every year for quite a few seasons. “Their home record let them down last year because they were playing on a small field (at Owlerton Stadium) and it didn’t suit them. “This year they are playing at the Keepmoat so it’s not a problem because it suits their style of play and they are my tip to finish third behind Leigh and Bradford. “They’ve got a lot of pace in their backs and they like to get the ball out wide to centre Menzie Yere and he’s difficult to stop in a one-on-one. “Kyle Briggs, who they signed in the middle of last season and someone we looked at, is also doing a good job for them at stand-off. n Dons season ticket holders can watch Rovers’ Good Friday clash at home Bradford City for £5 adults, £1 juniors. For more information call the ticket office on 01302 762576.